Head Coach Matt Nagy was “cautiously optimistic” that Tribusky would play. The line was available everywhere, signifying that Vegas was either extremely confident Tribusky would play, or simply didn’t care. This was new news, making Tribusky’s shoulder injury more serious than the “cautiously optimistic” Nagy likely thought. So, how did the line move? It didn’t. At all. We bet it at 3 Tuesday night, and it closed at 3. The reality is Tribusky has not been an effective passer this year, and backup Chase Daniel is extremely familiar with the system, ready to go at a moments notice. Besides, the Lions rank dead last in pass defense DVOA. This isn’t exactly a team to fear. As for the game, things started out close, with the Bears hanging on to a 9-7 lead due to a failed 2 point conversion attempt. The third quarter was scoreless until LeGarrette Blount rushed one in from 4 yards out. The Lions went for 2, attempting to make it a 6 point game. They failed, thus negating the failed 2 point conversion attempt from the Bears earlier in the game. Not that it mattered — as the Bears went on to steamroll the Lions in the 4th quarter, outscoring them 14-3 and winning the game 23-16. Since they were trailing in the 4th, the Bears had to rely on the arm of Chase Daniel, and he didn’t disappoint. Daniel finished going 27/37 for 237 yards, 2 touchdowns, and zero interceptions. ‘Atta boy, Chase. Look at that composure despite the rush. I love it. Moving onto our second Thanksgiving game, and I’m feeling good. We won our first bet, and my belly is full of turkey, delicious sides, and an interesting combination of Jim Beam and Bud Light. The day was magnificent. Things seemed too good to be true. They were. Of the 3 games we recommended, this was easily the toughest decision we had to make. The model was already Alex Smith-adjusted, so there was no need to further factor that in. However, the Redskins were also going to be without WR Jamison Crowder, WR Paul Richardson, pass catching RB Chris Thompson, and two offensive lineman (Shawn Lauvao and Brandon Scherff). That said, the model was to some degree injury adjusted for all of those players, since we had at least two games of data with every one of them out. The Cowboys also had a bunch of injuries on the defensive side of the ball. In the end, having the 7.5 point hook convinced us that there was enough there to green-light it. The line ended up closing at 7, signifying that more money had come in on the Redskins side. Maybe we weren’t so crazy after all. The Redskins went into the half down 10-7, but things were about to take a turn for the worse, but not before they got better. In the 3rd quarter with the score still at 10-7, WR Trey Quinn — he looks like he plays football video games rather than the actual game — caught a 10 yard touchdown pass from Colt McCoy. Then comes the extra point, which was wide left. Oh well, the Redskins are still up 13-10, and we have them +7.5. In terms of the spread, we’re effectively up 10.5 points. No big deal, right? WRONG. VERY WRONG. Because the Cowboys were about to blow this one up. They immediately answered with an Amari Cooper 40 yard touchdown reception (extra point is good). After a Redskins punt, Cooper then busted out a 90 yards score (extra point good, again). Then McCoy throws a pick, which Dallas turns into another TD, with another successful extra point. Suddenly it’s 31-13, and we appear screwed. But we aren’t, because it’s Thanksgiving, and Colt McCoy is thankful for having a job. The Redskins answer with a touchdown of their own, making it 31-20. After a few defensive stops (and a McCoy interception), the Redskins are driving again, but time is a major factor. It’s a dreaded gamblers scenario where a team is down 2 scores, so they will take a field goal if they need to. With 1:22 left, McCoy throws to Jordan Reed, which would have been enough for a first down. Reed drops it, mainly due to a helmet to helmet hit on Reed, who was absolutely a defenseless receiver. The refs swallow the whistle, possibly for the first time all year (unofficial stat). The Redskins end up settling for a field goal, and can’t recover the onside kick because onside kicks are basically illegal with these new kickoff rules. We end up losing by .5 a point, so that missed extra point made all the difference, indeed. Sunday morning roles around, and I’m feeling strangely desperate. A 12 point spread is painfully awkward, and I really don’t want to sit down on a freakin Monday and write a blog about us losing. 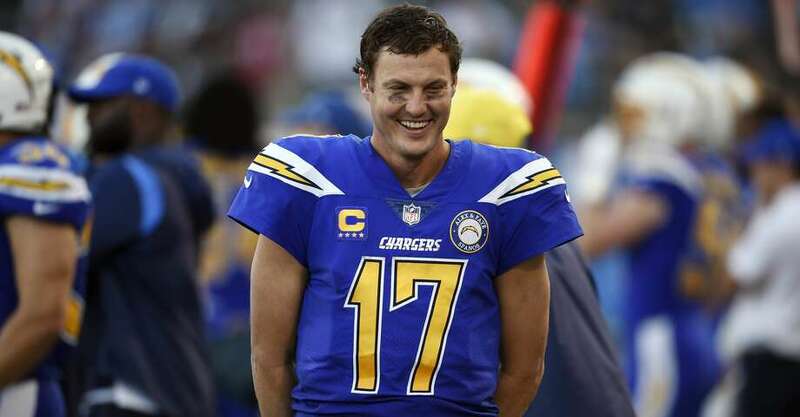 Rivers was on fire, tying an NFL record for 25 straight completions (set by Ryan Tannehill.. wait what?). He finished with only a single incompletion the entire game, and it happened with significant pressure on him. The Chargers were able to move the ball at will — even after Melvin Gordon had to leave the game with an MCL injury. In Gordon’s absence, Austin Ekeler stepped up big, catching 10 balls and breaking tackles left and right. On the other side of the ball, Josh Rosen was never able to get going. DE Joey Bosa is officially “back,” after gathering up a pair of sacks in the blowout win.